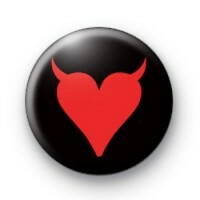 This black 1-inch pin badge has a red love heart with naughty devil horns. We have nicknamed this badge the devil heart. Are you a little cheeky or have a boyfriend/girlfriend that has a naughty side, if so this would be great for Valentines Day or for Hen Parties as a handmade memento. We have a few naughty themed love & romance badges in the shop which would be great if you have more of a devil side to you.